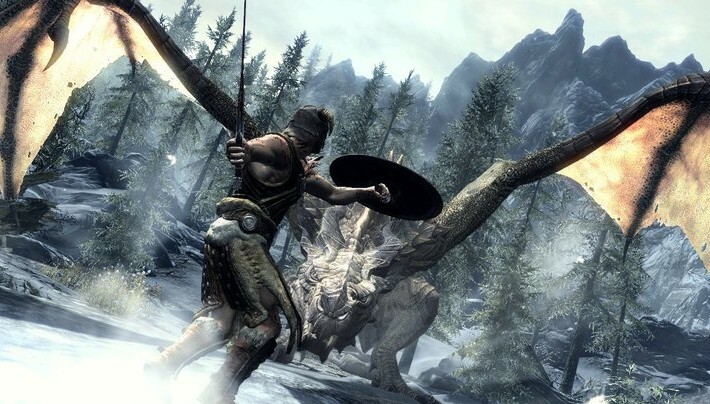 The Elder Scrolls Skyrim may be the best game I’ve every played. It’s not without flaws like texture popping and clipping issues (even on my dual Nvidia 570GTs with 3.2 GHZ quad core and 24 GB of DDR3 OCed RAM), or random floating corpses but God dammit it’s as much fun as banging a hot stripper (almost). I’m 40-50 hours into the game and I’ve only scratched the surface. Rock, Paper, Scissors had a great early review of the game, that I hoped the author would keep updating, but alas he hasn’t. I’ve decided to borrow his format that goes something like, “what I have done, and what I haven’t done,” since it seems to be the only way to review the game effectively. With more than 300 hours of scripted content, that’s right 300 hours, and a procedural quest generator (that can gen up new quests forever), it’s possible to play the game indefinitely. Even better, it’s possible to play the game in so many different ways, that I’m tempted to start a second character right now and go through the game in a completely unique way. I’ve even noticed in the forums that they’ve taken to surveying people with the question of what have you and haven’t you done. UPDATE: I finished the game. After a mere 106 hours of game play, about 4 and half days of my life, I am done. I completed all the major guild quests, cleared almost every cave, finished the civil war and the final main story battle. Eventually, I created super weapons that made the game trivial. I killed giants in two hits. I killed the final dragon with 9 hits. I was a legend in the small space of the game’s virtual walls. I figured out ways to fast level all kinds of skills like alchemy, enchanting, armor and conjuration. A few hints, cast the damn Muffle spell over and over and watch your conjuration level constantly. Make daggers, enchant them with the Ban Daedra enchantment and it makes them super valuable, so you can make about 600 gold in profit every time. You also get good at enchanting and smithing, which are essential to crafting the ultimate weapons that make the game a masterpiece. I have not completed much of the main quest. I have not picked my character for his advantages to a specific play style. I just picked a dude who looked cool. I haven’t used shouts that often and generally find them useless. I have started to use shouts a lot and find some of them incredibly useful. I am not a vampire and I will reset the game if I turn into one. I have not killed a shopkeeper, though I did kill one and restore to an earlier save. I don’t have a horse, mainly because there are so many jagged cliffs and mountains that riding one is largely pointless. I have not bought any houses. Shadowmere, who I won after completing the Dark Brotherhood, quests is the ultimate horse. Towards the end he accompanied me everywhere. I have not worn light armor, except when I started the game. I didn’t get married yet. Just like in life, I’d rather not. 🙂 I would sleep around in the game if I could. I have not cast any Illusion or Conjuring spells. I have not joined the Bard’s Guild, or the Dark Brotherhood. I have not found any weapons above a glass weapon. I now have several unique Daedric weapons. Behold Dawnbreaker and the Mace of Malog Bal. I have not crafted any armor or weapons. I have crafted armor now. Eventually, I crafted a set of armor with more than 14000 protection and weapons that hit for 480 damage that I could dual wield, by stacking potions and enchantments. I have not dual wielded one handed weapons. I’ve taken to rolling with a staff and sword sometimes, for serious fights. I have not wielded a staff, even when I got good ones. The staff of fireballs is fantastic, but wastes away quick. I gave the lightning staff to my companion and he is killing it with it. I have not killed any chickens in towns. I have not killed any wooly mammoths. I have not figured out what the hell all the dwarven cogs and plates are for. I have given myself over to the darkness and turned into a werewolf. I can open any lock, even at master level with only a few tries. Fired arrows and gotten good at it. I have improved some weapons, but I just can’t seem to get high enough skills in smithing to build anything useful. I finally figured out how to level up smithing and I wish I figured it out earlier, so I could be rocking some better armor already. I have put most of my magic into destruction. Wielded both single and dual handed weapons. Several of my companions have been permanently killed. Killed several of the dragon priests. I am almost done with the college of magic major quests. I have completed the college of magic story line and become the Arch-Mage, biznitches. I have started a few brawls in various towns. I have enchanted multiple items and reverse engineered a ton of enchantments. Thwarted an assassin’s attempt on my life. Dropped more stuff than I’ve found. Gotten sick of the same voices that reoccur again and again. Fought dragons with guys who were just trying to kill me a few seconds ago. Stood on top of a vast mountain, that was hard to climb and watched the weather change. Skyrim is a massive game. It attempts more with its side quests than most games do in their main storyline. It feels like a story you can sink into forever. Like I said, it’s not perfect. But when you put together 300 hours of content, there are bound to be some bugs. It just doesn’t matter. With a game that is this huge, ambitious, and gives you this much freedom, you just won’t care when you kill something and find it floating in the air. It’s the type of game where you can be facing a hit squad of thugs, only to have a dragon soar out of the sky and suddenly find everyone rallying to fight the dragon instead. It’s also the type of game where they just can’t find all the possible ways you can break the fourth wall with your infinite freedom. I mistakenly burned a guard during a fight with a dragon and the guards turned on me and arrested me. But I just reloaded and so be it. Save early, save often. I’m going to be playing this game through Christmas. But at some point I’ll have to tear myself away. I remember reading a quote from Slash about Guns and Roses on his playing of Guitar Hero. He got crazy good at it and then realized he was playing even when he should be making music, so he stopped. Eventually I’ll have to get back to real life. For now though, it’s fun to live in a fantasy world. Playing Guitar Hero is making music for Slash! Nice review. It seems that this game is following your real life to a tee. It’s amazing how much this game actually mirrors the player’s real life. It’s not just me. I’ve been reading different reviews everywhere and since the game gives you so much freedom, people inevitably craft a play style that’s truly reflective of their personality. FYI: Kevin thinks this is my worst article yet. I say Long Live Skyrim!